The best thing to do when you feel light-headed is to lie flat. But if you can't do this (for example, if you're outside on a footpath or at work) then cross your legs and squeeze them together, as shown in the picture on the right. This is the quickest way of increasing your blood pressure quickly when you're standing. You can also try squatting, but some people (particularly those with sore knees) find this hard to do. If both of these are difficult (for example if you're sitting down), grip your hands together, as shown in the picture, tense your arms and pull against your hands (moving your elbows away from your body). If your fainting and light-headedness is caused by low blood pressure, you can slightly increase the amount of salt in your food. You can do this by sprinkling half a teaspoon of salt on your meal at night, or perhaps have salted porridge for breakfast in the morning. Don't add more salt to your food if you are being treated or monitored for high blood pressure. 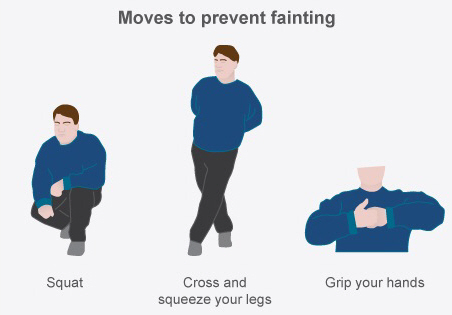 If you faint quite often, especially when standing or just after exercising, it's a good idea to wear tight-fitting clothing below your waist. One of the best things to wear is compression sports clothing, commonly called Skins (their brand name). You have probably seen sports people wearing these. The tight leggings will stop blood pooling in your legs, so it's less likely you will faint. You may find these a bit uncomfortable on hot summer days. Alternatively, you could buy below-the-knee compression stockings from the pharmacist. Ask for grade two compression stockings. You will need to get these measured. You can buy a device to help you put your compression stockings on. This video shows you how to use one of these devices. You can buy a device like this at your local health and mobility shop. Written by a Canterbury DHB physician. Adapted by HealthInfo clinical advisers. Last reviewed March 2019.